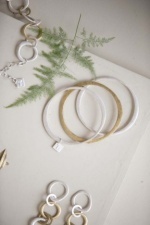 Simple set of three bangles, featuring a gorgeous uneven finish. Layer up and team with a variety of styles. These bangles are a timeless piece. Available in Light Antique Silver and Light Antique Gold mix. Made from a mixture of metals - nickel free plating. All products are exclusively designed by Tutti and Co. Inner diameter 6.5cm.